The Study Spirit Badge reminds the Monster Ranger to continuously Study the monster-world of Obscuria and the Monsters themselves. This badge was a featured reward for our 2017 Monster Scouts Membership Drive Kickstarter. 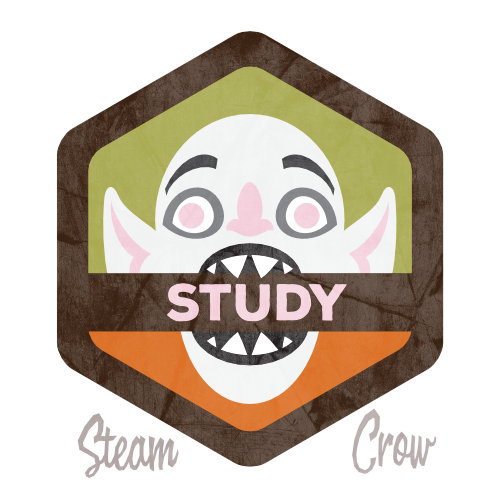 There is but 1 level of the Study Spirit Badge, featuring Bat Boy! This Spirit Badge subject (the Bat Boy) was recommended by one of our Rangers on our Facebook Group. The Study Badge is worth 10 Glory points. Bat Boy’s bite symbolizes his hunger for knowledge, and… blood. But mostly knowledge. This is a common badge. You can order one here! You don’t turn this in for credit; you simply log it into your personal Rangers Sketchbook – Ranger’s Honor!